Yes, this is Faris aka The Rascal, with my most momentous news to date. Or at least the most noteworthy since the Twinkles, Tala and Lilia, put in an appearance which was, to be truthful, even more shocking than when one of my bottom front teeth started wobbling the other day. I was so worried. I thought maybe everything might start to come loose and fall out like my Grandad’s hair. 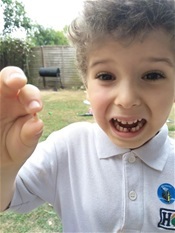 It was only when Mummy explained it all to me that I started to get the whole picture - most especially when I realised that there was a Financial Incentive to the whole wobbly tooth business. This is the way it was explained to me. When your tooth starts to wobble and eventually falls out, all is not lost. (This, incidentally, is why I don’t understand why people talk about “losing” a tooth: it would be more accurate to describe it as a kind of Exchange and Mart.) Once the Tooth is finally out ( as in out out, I think the expression is) then you put it under your pillow before you go to sleep and wait for the Tooth Fairy to arrive, collect the tooth and leave a substantial amount of cash in its place. I am personally not at all sure about the Tooth Fairy. I reckon a Tooth Dinosaur would be far more appropriate, being, as I’m sure you would agree, properly toothsome. Nanni is keen to know what the Tooth Fairy’s going rate is these days. Apparently when my Mummy was the same age as me, a tooth was only worth something called a shilling - which is just five pence. I am keeping all my fingers crossed that there has been a substantial rise over the years. It would hardly be worth going through all the wobbling anguish for five pence. Tala and Lilia say: It simply isn’t fair! We want the Tooth Fairy to visit us too. We are much more interested in meeting up with her than Faris is, so we are feeling hard done by, even if he is Our Hero as well as our big brother. We have both tried and tried to make our teeth wobble but they simply won’t budge. It isn’t the money that concerns us either. Well, not much anyway, though we do agree with Faris that five pence would be a poor exchange for what Nanni calls a Pearly White. No, we want to see the Tooth Fairy and ask her what she really does with all the teeth she collects. Then we can test out Cousin Hazel’s theory. As it is, we gather we are going to have to wait until we are older before the Tooth Fairy comes to call. Even worse, we have been warned that she will probably be back again a few times in between now and then to collect more of Faris’s teeth before we get even so much as a look in.